To begin, I affirm that each of us views life differently. By using our personal thoughts and experiences, we effectively can create a unique system of beliefs about ourselves, others, and our world. In effect, we create a way of being in the world. Critical moments in life are those which test our way of being in the world. When adequate to the test, we are affirmed and our ways of relating strengthened. When inadequate to the test, we are called upon to let go of one way of being in the world in order to develop a more adequate way. During Great Lent and Holy Week, we were challenged to surrender our cherished and familiar ways of being in order to be open to the new life and freedom for the present and future that our Orthodox Christian faith calls us to live. For the maturing Christian, St. Paul encourages that we become engaged in the struggle of faith, confident that Christ has made us His own, but knowing we are not yet perfected. Thus, we are zealous to “strain forward to what lies ahead” (i.e., “press on”) toward the completion of our salvation, “the prize of the heavenly call of God in Christ Jesus.” In “forgetting what lies behind” (i.e., “letting go” of those things that impede our spiritual growth), we acquire our Lord’s resurrection leading to eternal life. My brothers and sisters in Christ, we encounter many “letting go” experiences in life. Sometimes letting go involves another person. The first day of school the child must be able to let go of his parents, and the parents must let go of the child. This is but one of several epochs in the life of parents and children, when each must let go of the other. The manner of each letting go has profound implications for each return and each subsequent separation. In like manner, friends are gained and lost, couples come together and break up, and marriages are formed and broken. Whether through death, or variations on death, such as disillusionment and rejection, we are called upon to let go of others. Sometimes that letting go involves a place: We leave our home towns and home lands; we leave our schools and parishes. Sometimes that letting go involves roles, positions, or patterns of relating. We are called upon to let go of our roles as children, as parents, as students, as co-workers, as neighbors, and then to find new roles, new positions, and new patterns of relating. Sometimes the letting go involves one’s attitudes, one’s beliefs, or one’s values. And the pain of such letting go need be no less acute. As we journey closer to God and learn to let go of those beliefs and practices that separate us from Him, we effectively are asked to give up beliefs that previously nurtured us, that made sense out of our experiences that identified us, and that gave our lives meaning and direction. In the moments when we are asked to let go, we come to realize how intensely loyal we are to people, to the places, and to the attitudes and beliefs which have shaped our way of being in the world – indeed, which identify us. For when we let go of those with whom we have experienced the world, when we let go of those places with which we have been associated, when we let goof those beliefs which represent our experiences, it is as though part of one’s self is surrendered. In a profound sense, it is a time of relinquishing the world as we have known it. So we are afraid: afraid to relate to people in new ways, afraid to move into new places, afraid to be open to ideas different from our own, and afraid to risk having to lose ourselves and our way of being in the world. Is not the pain of letting go the fear of death, death of ourselves and the world of ourselves? So we guard ourselves. We attack and counterattack; we bluster and fume; we draw back and hide; we coax, whine, intimidate. But such safety comes at a high price. Cut off from others, frightened and alone, with our strength wasted in defense, we are without the support and renewal which relationships provide. But most of all, the price paid is that of authentic being in the world, to our loss and to the loss of others who need our authenticity. I always cherished the lessons I learned at one of our Clergy Retreats at the Diakonia Retreat Center. Our retreat speaker, Fr. Christodoulos Papadeas stressed the importance of “Knowing Oneself.” In effect, he called us to free our awareness from our constricted way of being in the world through a heightened sense of awareness, an awareness which comes in moments of communion with God and His Holy Church found in worship and prayer, and in deep interpersonal moments. In such moments, we may become aware of our essential being, a heightened awareness of ourselves as more than merely ways of being in the world. To free one’s awareness from one’s constricted way of being in the world also calls for a heightened awareness of just how one is in the world, the awareness of the way of relating that has developed over the years. Such awareness comes through our ability to see ourselves as others might see us, and to hear their response to our way of being in the world. We discover that we do not always listen to others, that we can be intimidating, that we can deny our anger, and at times, we are frightened. There are those who would go with us in the search for our essential being and help us discover the ways we have of relating to the world. Yet in the final analysis, without God as our Lord and Guide, we are alone, and we risk being totally alone. Yet in that risk, we find that His Spirit meets our soul, and through Him we are not cast into outer darkness, but responded to, supported, and affirmed. I pray that the Spirit of God hover over the darkness in our lives and the void within us . . . to bring light and form. Letting go may be viewed as self-surrender, a self-surrender which results in death to be sure, but a death followed by life, in a re-birth whose labor is as difficult as our first birth though now we bear the pain of birth. Letting go is the way to life through death of the old self. Another way of saying this is that what is sought is freedom from the past . . . from the self of the past. This is not to say that there is no continuity between the new life and the old life, but that we move into the empty space between the old life and the new life without the guarantee of continuity. This means living in the present, willing to let go of the past in order to answer the call of the future. Yes, we do battle with the past in order to answer the call of the future. This is a gamble with our lives as the stake, our life stance, our way of relating to the world, our way of being in the world, our very selves. The risks we are called upon in moments of life are in a sense immediate versions of the ultimate risk which is death. Then I am reminded of Him Who faced the terror of self-surrender with the cry, “My God, my God, why have You forsaken Me?” (Mt. 27:46) and Who was willing to assume the risk that life had no future yet nonetheless, with faith in the outcome, asserted: “Father, into Your hands I commend My spirit.” (Luke 23:46) And each day of our lives, He summons us into the future, into the unknown, into a new way of being in the world. 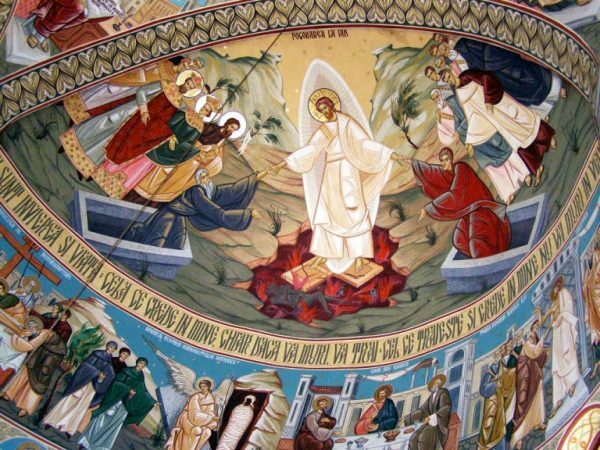 In response to the Feast of Holy Pascha, let us pray that God helps us to “press on toward the goal for the prize of the heavenly call of God in Christ Jesus.” (Philippians 3:14). Indeed, let us seek to let go and to become free to live with God, now and forever, and to the ages of ages. Amen!